Daily self-care is the most important element of healthcare. Ayurveda is a daily adventure that provides a lifetime of health and happiness. Root into daily self-care and expand into infinite potential in all aspects of your life. An Ayurveda Lifestyle Consultation provides you with the very best navigational tools to create optimal health, vitality, and creativity. I love helping clients discover and experience the basic elements of Ayurvedic self-care: Nourish. Cleanse. Rejuvenate. Pamper. Create. These simple and sacred practices, when done with great awareness and gratitude each day, will transform your life in all ways. Over the past 11 years, I’ve consulted with and created Ayurvedic Daily Routines for hundreds of clients, including athletes, artists, musicians, college students, nurses, lawyers, cancer patients, seniors, children, and yoga teachers. I’m a huge believer in the power of baby steps when making life changes! Personalized yoga routines are available for an additional cost. These are colorful hand drawn routines that show an Ayurvedic marma point for each pose, as well as energy alignment intentions and inspiring meditations for each pose. After initial consultation, following sessions include guiding and supporting your customized Ayurvedic Dinacharya and making adjustments and enhancements to the daily self-care routine, as needed. Depending on the client’s needs, follow-up sessions include Ayurvedic Lifestyle Counseling, yoga, and marma therapy. Discover and understand your unique body-mind make-up. Initial consultation is 75 minutes. Follow up sessions are 30 minutes. Package discounts available. Frequency of follow-up sessions is determined during initial consultation and assessment of health and well-being goals. For your convenience, consultation and follow-up sessions can be done at client’s home, for an additional charge. 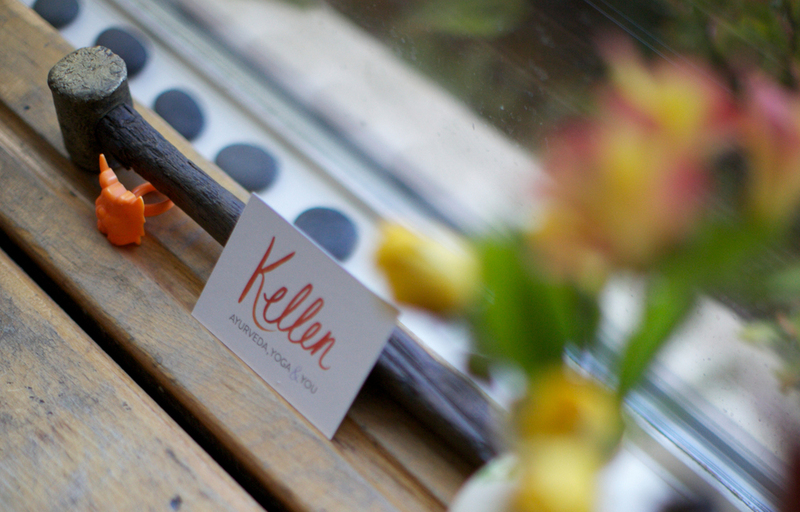 Click below to reserve your time with Kellen!